Dr. Rachelle Yankelevitz (left) gathers with walk participants. 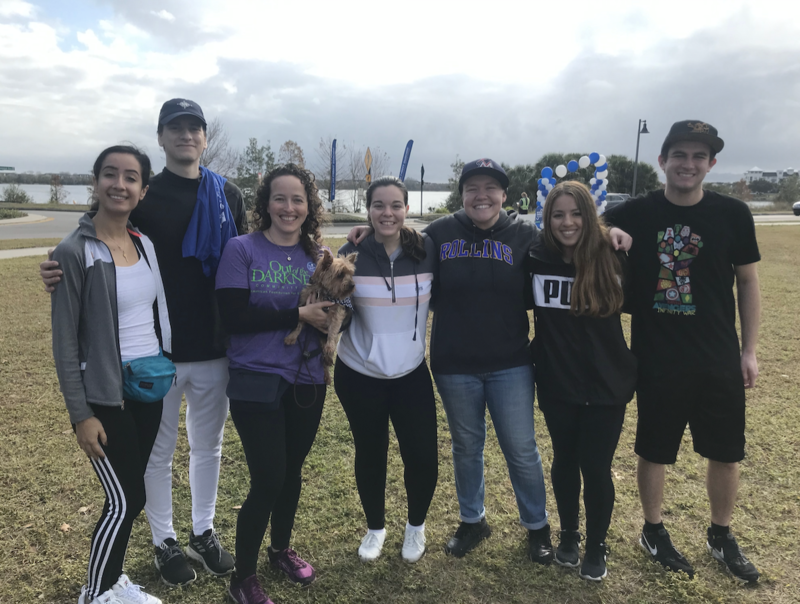 Last weekend, members of the Rollins community participated in Orlando’s 12th annual Out of the Darkness community walk in aid of suicide prevention. The Department of Psychology and Hillel, the Jewish student organization, both created teams to join the walk. The Rollins chapter of the National Honors Society in Psychology, Psi Chi, represented the department’s team. Psi Chi set up a table during the event and generated $300 in funds for the American Foundation for Suicide Prevention (AFSP). This year alone, a total of 211 teams and 1,971 participants raised $141,241 for AFSP. The goals of AFSP are to increase awareness of the issues surrounding suicide and to raise funds for the advocacy of new research on suicide loss and prevention. The organization aims to reduce the annual suicide rate by 20 percent by 2025. The department has been participating in the Orlando event since its inception 12 years ago. This year they were led by the department’s administrative assistant, Vicki Long, who lost her father to suicide. Long was also the chair for the Orlando Walk, which occurred in Baldwin Park. After a member of Hillel died by suicide this past summer, Emily Block, the associate director of Jewish Student Life, explained that Hillel’s efforts to organize a team to walk is just one step in its goal to becoming more aware of mental health. The event was complete with booths stationed all around Baldwin Park, and in the center a stage showcased the opening ceremony, as well as the performance of Dance Out Bullying, a non-profit organization dedicated to raising awareness of and preventing bullying. 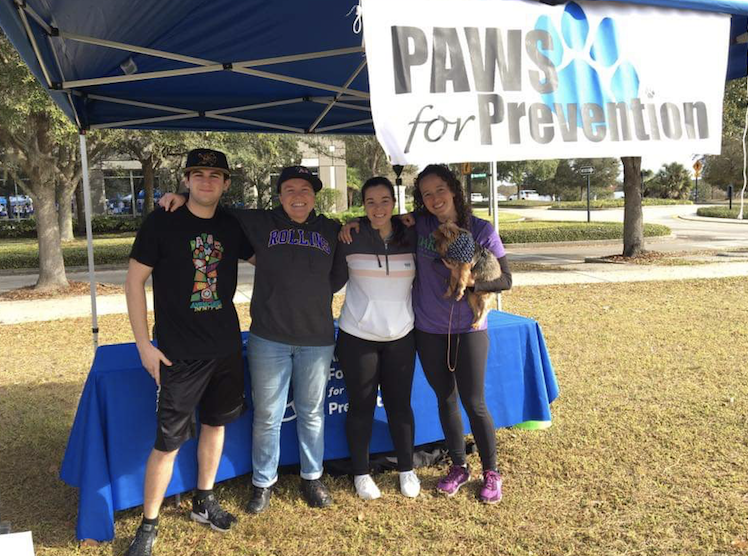 Psi Chi’s table, which was called Paws For Prevention, shared information on websites for suicide prevention and the suicide hotline. It also sold handkerchiefs for dogs that read Paws For Prevention, dog toys, pet food, and bowls. A raffle was held at the end of the day, and the winner received the entire display on the table. Besides its participation in Out of Darkness, Chi Psi promotes mental health awareness on campus by collaborating with the Wellness Center during its annual Wellness Fair. Its group, Elephant in the Room, spreads discussion about suicide awareness while promoting the idea that people have a lot more in common than they think.